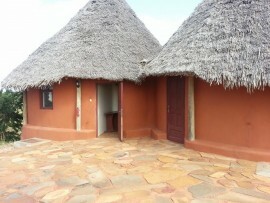 Lions bluff is located in the Lumo community wildlife sanctuary, between Tsavo West National Park at the coast. 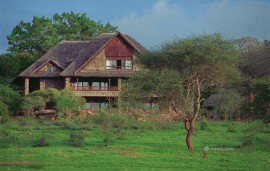 Lion bluff is an intimate and beautifully designed mid-range safari lodge made of sustainable timber canvas and traditional coconut thatch and has an open terrace with magnificent views of Mount Kilimanjaro, stunning panoramic views over the golden green Tsavo Savanna and the Taita hills. The lodge offers day or night game drives and bush walks where you can spot Elephants, hyenas, aardwolf, honey badger, lion, cheetah, leopard, buffalo, giraffe, zebras among many others. Lions bluff lodge has 14 traditionally-built en suite bandas with individual terraces that provides outstanding views of the plains below and Mt. Kilimanjaro. Each room has either double or twin beds and one family unit. 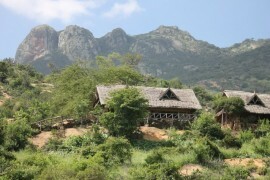 For the more adventurers tourists Lions Bluff has a campsite, The Cheetah campsite which has water, kitchen room,showers and toilets, wood fuel and leveled areas to mount the tents. 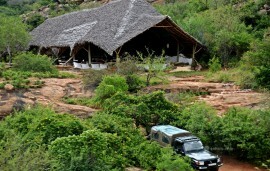 Campers can also access the lodge’s stunning dining area that overlooks an ancient elephant migratory corridor and a small waterhole visited by herds of elephants among other animals providing you with a great sight while enjoying your meals. There is a restaurant that caters to all food preferences and a free parking area.